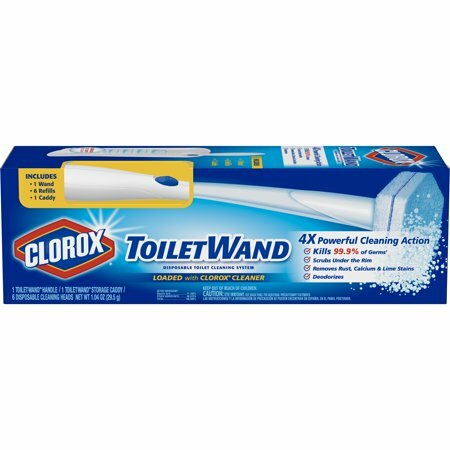 Clorox ToiletWand Disposable Toilet Cleaning System is a convenient way to a quick clean toilet. The starter kit contains one wand, 6 refills and 1 storage caddy to get you started on a deeper clean. Each disposable head is preloaded with Clorox Cleaner with 4x the powerful scrubbing action to clean tough stains, kill germs, remove rust, calcium and limescale while it disinfects and deodorizes with ease. Based on comparative lab tests, the toilet wand cleans better than a brush. The sponge like cleaning head is shaped so that you can get into every nook and cranny needing cleaning and germ control while killing 99.9% of germs like staphylococcus aureus, salmonella enterica, rhinovirus type 37 and influenza A. This all in one system is designed so that you get a brand new cleaning sponge every time you clean without having to touch a yucky brush. 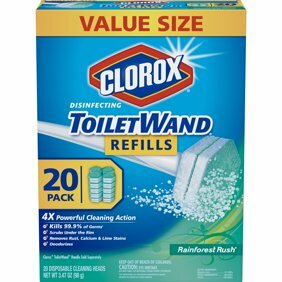 Just click your way to a cleaner toilet with the Clorox ToiletWand Disposable Toilet Cleaning Starter Kit. Disposable toilet cleaning heads may cause eye and skin irritation. Avoid eye and skin contact with cleaning heads. Keep handle and cleaning heads out of reach of children and pets. Ingredients: Glycolic Acid 11.185%, other ingredients 88.815%. Instructions: To disinfect, empty toilet bowl before cleaning. Open pouch of disposable cleaning heads and push handle straight down onto cleaning head until it clicks into place. Dip cleaning head in remaining toilet bowl water for 1-2 seconds. Scrub entire toilet bowl above the water line. Let sit 10 minutes. Flush to rinse toilet. 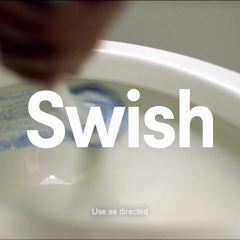 When finished, press cleaning head against the toilet bowl, slide blue button forward and release head into trash bin. Do not flush cleaning head. ToiletWand handle sold separately. This was unbelievably effective and easy to use. This product has removed all the dread that I normally feel for toilet cleaning as it is easy, effective, and most importantly, very sanitary! Anything that makes cleaning easier and faster is good in my book! Thank you for your wonderful review and for shopping on Jet, Allyson! OMG! LIke it was the 1st time ever! I bought this a couple of weeks ago, so today I figured I would try them!! I am amazed on how well they work! I normally clean with my normal cleaner and a bowl brush quite frequently but this put that stuff to shame. After using this it was like had never cleaned my toilet bowl! Thanks for such a great product! Love Love the Clorox wand! After years of having to sterilize my reusable bathroom toilet brush, I am now sold on these disposable scrub heads. The heads are octagonel and get into all the nooks and crannies needing cleaning and germ control. Additionally, I use the heads to scrub not just the toilet bowl, but can use new brushes for the bathtub and sink as well. This is an amazingly versatile product, and you don't need those yucky, smelly, dirty reused brushes in your bathroom, these come with a neat little plastic dispenser that easily fits beside the toilet bowl! Happy cleaning. Walmart delivered this product right to my doorstep! Long time user, but disappointed lately? I think I have been using this product since Day 1. First of all...I really WISH you would make them in FAUX FINISHES. I actually sanded a new one & spray painted it brushed nickel...It looks really nice and has lasted a few years. They are awesome for cleaning the bowl! They quickly remove rust & stains. It is also nice to clean the top & bottom of seat "hands free." I used to be able to use each pad a few times. I would rather clean lightly more often. Lately, I can't get through 1 cleaning without the wand separating and it is usually when you are down in the bottom...Then it is time to "go fishing" Disappointed lately, but will still use.